Way back when we had no idea what traveling with kids would be like, we went to Hawaii on a family reunion. Kalena was 9 weeks old. It was crazy, but that’s not the point. 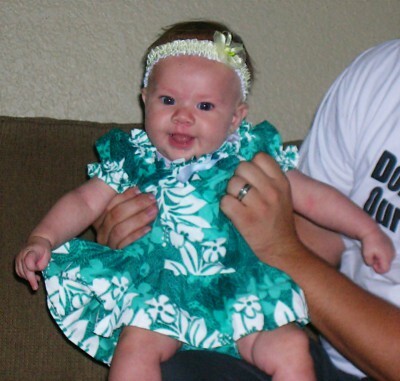 The point is, we bought Kalena an adorable little dress as a souvenir. 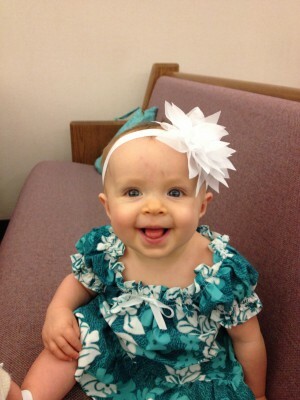 Not much of Kalena’s baby clothing has survived the years as hand-me-downs. We’ve passed everything down to my nieces, and received hand-me-downs back now that Lydia is here, but most of that is stuff that was purchased somewhere along the way. However a few things, usually dresses, have ended up back with us. And that little Hawaiian dress is one of those things. Super cute little Hawaiian girls! Those girls are terrific models! Cute!! I got rid of virtually all of Pacey’s clothes as we didn’t plan to have more after Brighton. I did save a few sentimental items and I have one Chargers jersey that all three have worn. Love seeing those pics. They have the exact same nose and smile. So cute!